Christmas pajamas have never been a family tradition in our house, but when I was trying to figure out what to give my nieces for Christmas, my sister-in-law suggested pajama pants for the middle schooler. And then, since I’m crazy, I decided to make matching pajamas for my both of my nieces and both of my daughters. Finished them the night before, but they were a hit. The cousins are 9 and 11 and we let the 11 year old pick the fabric. I went to Joann‘s to pick up some flannel and it was on sale for $2.80 a yard! Score. For the three older girls, I used the Parsley Pants pattern, though I had to grade it up for the 11 year old. I was pretty nervous about the fit because I had no idea what I was doing, but it turned out great! I basically added about 1.5 inches to the top, and 2 inches to the bottom and then cut the entire pattern along the tuxedo stripe line and added an inch to the width. Love this pattern for pajama pants!! I’m thinking of grading it up to make a pair for me! For the baby, I made Rae’s Basic Newborn Pants (free pattern) with a little added length. Of course, she’s already almost outgrowing her pajamas. The older girls got shirts from Target and Kaya is wearing a store bought onesie. I just added the yellow pocket to match the yellow on the pants and had to do some altering on Yuki’s shirt since it was way too big for her. 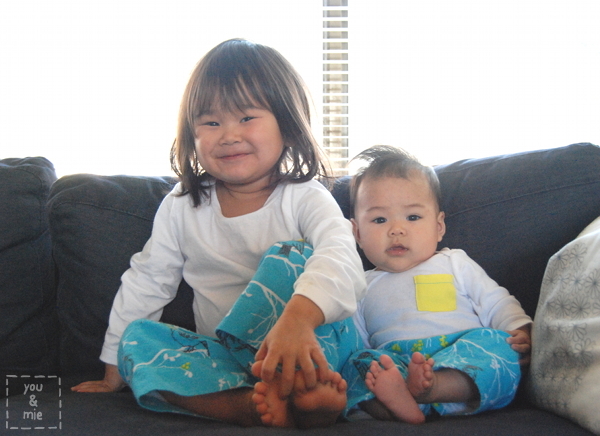 Yuki claims these are her favorite pajamas now and I’m certain that it’s because her cousins have the same ones. She absolutely ADORES her cousins and think they are the best. And they are. So Christmas pajamas weren’t a tradition before, but maybe they are now? I admit, it was pretty darn cute seeing them all running around (or just lounging around, in Kaya’s case) in their matching PJs. Check out my second shooter! Do you guys do Christmas pajamas? Where did this tradition even come from? Worth continuing? Apparently some of Hideko’s high school students totally dread it. Haha! Were you blessed with (or a victim of) matching pajamas as a kid? 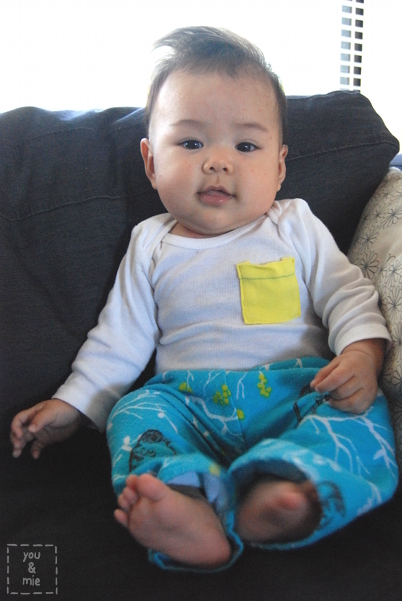 This entry was posted in sew & tell and tagged pajamas, parsley pants by Cherie. Bookmark the permalink. love them! & the “Dalton like photo” too!! We always do pajamas (although not always matching) and did it in my family when I was a child – my mom always said it was so we didn’t look scruffy Christmas morning for photographs! We never had Christmas pajamas growing up but I have taken to making sure my girls have cute ones. However, the younger one has a mind of her own and ended up wearing her favorite night gown instead. At least it was green? I’m thinking of making them cute flannel pajamas or nightgowns for next year and turning it into a tradition. Forgot to say that I love the print your niece chose! Oh yes, I totally know what you mean about kids having a mind of their own. I think Yuki only likes these because she matches her cool older cousins. Maybe you can let her pick out her own fabric?? I think I will have to let them pick out the fabric AND the pattern. Though getting both girls to agree on fabric might be difficult… And even then, they might change their mind by the time everything is sewn up! That’s really sweet! And I agree that making them non-Christmassy means longer wear for sure. It seems a very North American tradition from what I see in blogland. I know some grandparents give new winter pjs at Easter – which is the start of Autumn here in NZ. In saying all of this, I made my 3 yr old nephew summer pjs for Xmas this year and loved hearing that he wore them to bed that night! I had never even heard of the christmas PJ tradition until a year or so ago… but I am a huge PJ fan, and that fabric is gorgeous. I would have made myself a pair too! Me neither!! I actually have flannel fabric for me (a different fabric) waiting to be made up into pajamas. Just need to find the time! We do Christmas pyjamas, wrapped up and waiting on the bed before bedtime…… But I usually buy them!! Not any more! Those are fabulous so much nicer than shop bought! Love these! That looks like a favorite Amy Butler fabric of mine from last year. We have always done the pajama tradition. Even if its not a tradition, PJs seem to end up part of Christmas anyways…it always seems to be on someones wish list or a stocking stuffer. My Aunt keeps the Christmas Eve tradition going by buying each grandchild (mind you there are 7 of them from 6 to 21) a pair to change into at the end of the night, and now that I have my daughter, she was thrilled to buy her 1st and 2nd set. I cant wait to make them for any occasion. oh and as far “worth keeping it” that is a huge yes. Even my 18 and 21 year old cousins love wearing them with younger kids and we take great pictures of the little ones on top of the older one’s shoulders in front of three. Yeah, it’s just such a great gift regardless, huh? Super cute that the adult cousins are still into it!! These are SOOO cute! I love the fabric. We never did matching pjs, but mom always made us matching halloween costumes… I’m sure my big sis loved that. 😉 They were so awesome though, looking back. Hope I can one day do the same for my kids! I had never heard of this tradition until I started reading blogs so obviously it’s not something we do. It’s a cute idea though personally I like to avoid starting traditions that REQUIRE me to make something, especially around the holidays. Holidays are crazy enough as it is! I really like how yours turned out. The blue flannel was a great choice! Thanks! My suggestion for a beginner would be to find some good solid patterns to start with. If you’re thinking about doing clothes – Oliver + S is great for kids clothes (and Liesl and Co. just put out women’s clothing patterns too) and Made by Rae. I don’t have any specific suggestions for any other type of sewing (quilting or home dec, for example), but I’m sure there are a ton of resources out there for any type of sewing. And then just go for it! Buy some not so expensive fabric and just try things out. That’s how I learned to sew clothes – just experimenting and looking up tutorials online. In terms of altering/adapting patterns, I really don’t have much experience with that at all. Oh, you know another idea is to use video classes and workshops, through Creativebug or Craftsy! I hope this helps. Good luck!! They are all so cute! Growing up I never had new pjs for Christmas. I started buying new pjs for the kids after I looked at some Christmas morning photos of them when they were 8 months and 2 years old and were wearing dingy old pjs. Love these!!! And super-good to know about the size 11 Parsley gradeup…NICE! Super duper cute!! I want some parsley pjs too – maybe we need to get Rae on this. Heh. Oh and our Christmas pajama tradition was because our giant extended family Christmas Eve parties were right after church and didn’t end until midnight or later when I was a kid, so it just seemed practical to change out of our fancy Christmas clothes into pajamas at some point during the night. Then my folks could just plop us into bed after we fell asleep in the car on the way home. 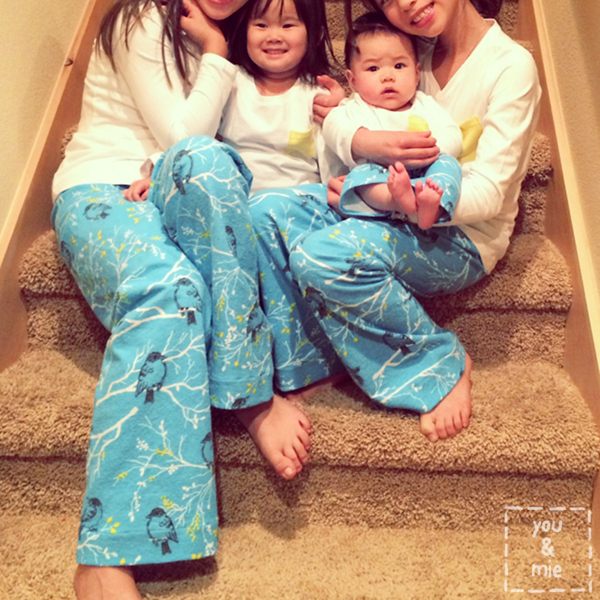 The parties simmered down over the years, but the pajama tradition continued! Thanks! If I grade it up, I’ll let you know how it goes. So cool to hear your family’s story – that makes sense! 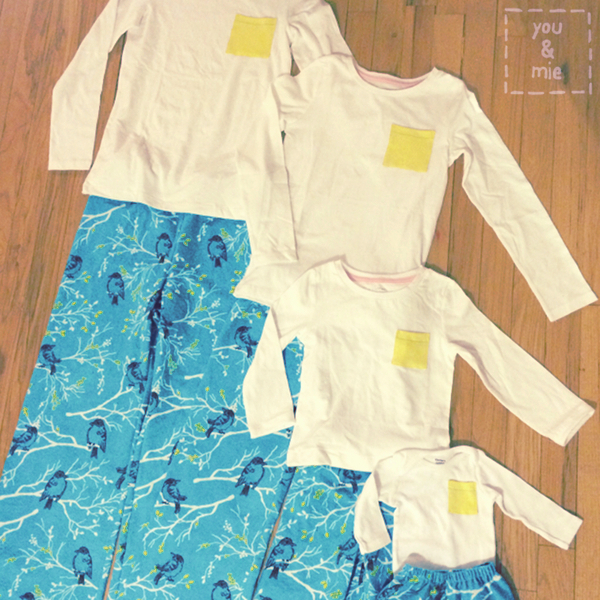 Did you make PJs for your kiddos? And all their cousins!? The kids look fantastic. 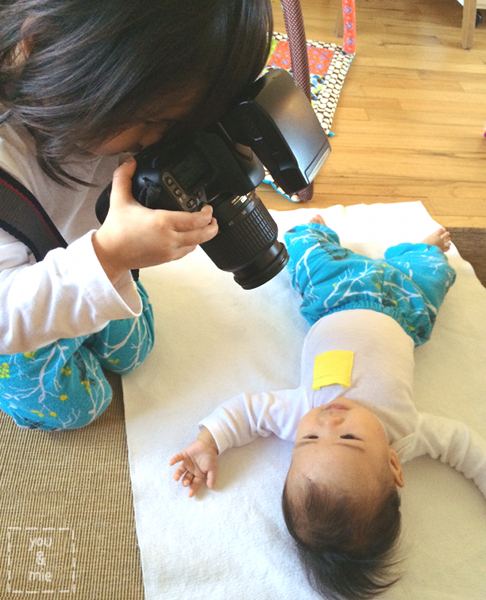 I love that last photo, behind the camera Yuki could be my nephew’s twin. they are so alike! I’d never heard of the Christmas pyjama thing until reading sewing blogs. It can be so hot in Australia around Christmas time that pyjamas may not be worn at all! So cute! I had big plans to make Christmas pjs for both kids but that plan got scrapped when I realized how many things were on my to-make list and how few days were left! So I bought matching pjs from Hanna Andersson instead. Next year I do plan to make pjs and give them on winter solstice. We never had any pjs tradition as a kid, but I like the idea of looking a bit put together for Christmas morning pictures! This is a tradition in my family and I never appreciated how much work it was for my mother until I became a mom myself. She used to make long flannel nightgowns that probably took 4+ yards of fabric. All that gathering! I love doing it for my kids now too. I used the Parsley Pants pattern this year too!